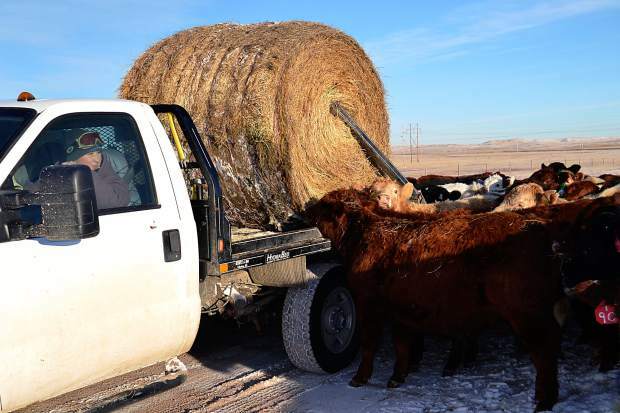 Kendall Roberts feeds cows on the King Ranch in Wyoming, where she is part owner. Courtesy photo. On a painfully cold (and early) morning, Kendall Roberts braids her hair, pulls on her warmest chore clothes and heads for the feed truck. Getting the King Ranch's three herds of cattle fed is her top priority because at -6 degrees with a wind chill of nearly -20 cattle need nutrients and water to keep warm. Kendall is a co-owner/operator and general partner at King Ranch located a few miles west of Cheyenne, Wyoming where the number of wind turbines is an indicator of the harsh climate. The King Ranch, originally established in 1911 as a sheep ranch, turned to cattle in the 1960's. The ranch ranges in elevation from 6,400 feet outside Cheyenne to 8,600 feet on the U.S. Forest Service leases in the Medicine Bow National Forest. Kendall's father, Mark Eisele began working on the King Ranch as a hired hand when he was 15 years, old. His years of hard work and contributions to the ranch's cow herd and diverse business interests earned Mark a partnership in the ranch. Mark has given that same opportunity to his daughter Kendall. Along with the title of co-owner though, comes early morning feedings in bone chilling temperatures, sleepless nights during calving season, and countless hours of bookwork. Her siblings also are involved with the ranch. Kendall's older brother Colton also lives on the ranch while working as a pharmacist at the Cheyenne VA Medical Center. Kendall's younger sister, Kaycee, lives in Colorado but still has cattle on the ranch. "One thing I love about the turbines is that they tell me where to feed, " explains Kendall as she unrolls a 2,000 pound round bale of meadow grass hay at the southeast side of a hill where the loose strands have less chance of being blown away. "We don't have many trees out here so I feed where the cattle will be protected and are as close to a water source as possible. We don't want them to have to go far and expend a lot of energy to get food and water. They need all of their energy to stay warm." Every day, Kendall tends to three herds of cattle in separate locations. The three herds include cattle owned by Kendall and her father, a herd owned by other family members and the King Ranch Legacy Herd, which is comprised of cattle whose genetics can be traced back to the original King Ranch cattle from the 1960's. To transport the hay to the cattle, bales are loaded by a hydraulic arm onto a flatbed truck. The arm then drops the bale onto the ground where Kendall chips away layers of ice and snow on the outside of the hay to expose the nutritious under layers of quality feed. "Each cow needs about a ton of hay per winter to maintain their body condition and produce a calf," Kendall says. "Cattle are resourceful, though. They'll still graze through the snow and eat the pasture grass." Most years, the King Ranch harvests nearly all of the hay they need to feed the three herds. Kendall also must ensure that the cattle have access to water, which is no easy task when the Wyoming cold sets in. 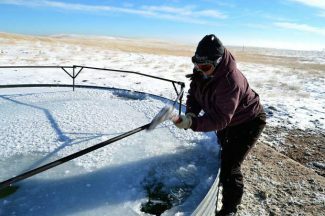 This time of year, it's a daily occurrence for Kendall to chop through several inches of ice formed on the top of the water tanks. In fact, she carries goggles in the truck to protect her eyes as the chips fly. The ranch has 12 wells and tanks for the cattle; some are wind-powered, some are electric but any of them can freeze up. "Even tank heaters can't always keep up with the temperatures here," says Kendall. "When pipes freeze, I break out the propane torch and get to work." As she feeds, Kendall carefully looks over each animal looking for signs of illness or trouble. "Even a drooping ear is an indication that something could be wrong," she explains. And, she knows the cattle as if they are family. "They are family," she laughs. "That one," she says, pointing toward a large-boned red cow, "is the oldest cow on the place. She's been with us 19 years and has given us 17 calves." "Caring for cattle has always been my calling," says Kendall, who has a Bachelor's degree in Agriculture Business and a Master's degree in Agriculture Economics from the University of Wyoming. She lived and worked in Washington D.C. for a brief period and appreciated the exposure to the political world that has so much impact on the ranch's day to day operation. "We don't raise cattle in a vacuum," Kendall points out. In addition to their dedication to caring for their cattle, the Eiseles take being good stewards of the land seriously. In 2005, the Wyoming Section of the Society for Range Management honored Mark Eisele with its Excellence in Rangeland Stewardship Award. The King Ranch was recognized for implementing environmental stewardship practices through a collaboration with the U.S. Forest Service and the University of Wyoming to initiate a rangeland monitoring program. The King Ranch is not alone in its strong commitment to raising healthy cattle for high-quality, nutritious beef while protecting the land for future generations. 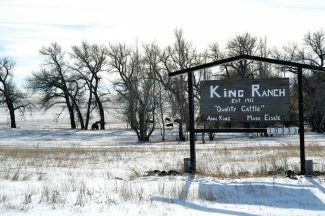 To read more about more Wyoming ranches, western traditions and how beef makes it from pasture to plate, please visit wybeef.com.